Deb Kandelaars is the author of Memoirs of a Suburban Girl (Wakefield Press, 2011), a most impressive debut novel which was recently reviewed on this blog. The manuscript won her a Longlines residential fellowship at Varuna, The Writers’ House in 2009 and was short-listed for the Adelaide Festival Awards for an Unpublished Manuscript in 2010. She was born in the Riverland, South Australia and grew up in Adelaide’s north-eastern suburbs. 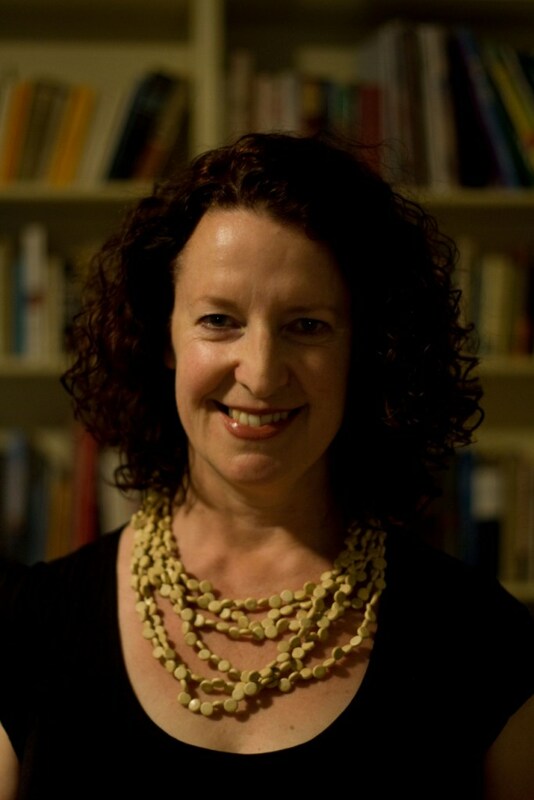 She graduated from the University of Adelaide with a Masters in Creative Writing, and began her writing career with non-fiction titles: Postcards: A Few of Our Favourites was published in 2001 by Wakefield Press and ABC Books published Moments in Time: True Life Stories of Australian Men and Women in 2004). Deb has kindly agreed to contribute to the ANZLitLovers Meet an Aussie Author series, with answers to the usual questions! 1. I was born in the Riverland, South Australia, the granddaughter of two families who owned fruit blocks. 3. The person who encouraged/inspired/mentored me to write was, firstly, my Mum, because she bought me books and took me to the library every week; and, secondly, Tom Shapcott who was the inspirational head of creative writing at Adelaide University many moons ago. 4. I write in my study, in my own special quiet time – early morning or late evening. 5. I write when I have a deadline to meet – external or self-imposed. Most of the time I need a good kick to get going. 6. Research is watching and observing everyday life. My daughters tell me off for staring at people or eavesdropping on conversations in public – I can’t help it, people are fascinating! 7. I keep my published works in a bookshelf in the study. When I pick them up and hold them in my hands, it seems odd that they have my name on them. 8. On the day my first book was published it felt strangely anti-climactic at first, but when I held the book in my hand, I was overwhelmed. I saw ‘Memoirs of a Suburban Girl’ in a bookshop window for the first time on Christmas Eve – it was surreal. 9. At the moment, I’m writing lots of newsy emails to old friends. I’ve written the outline for a new novel, but that will have to wait for the new year. I plan to do nothing but sit in a chair and read over summer. 10.When I’m stuck for an idea/word/phrase I listen to old songs from my youth. It’s amazing how evocative music can be. So it looks as if those primary school ‘On the weekend…’ journals might bear fruit after all, if that’s what gave Deb her start as a writer! The photo at left is one that inspires Deb; it’s on her desktop. 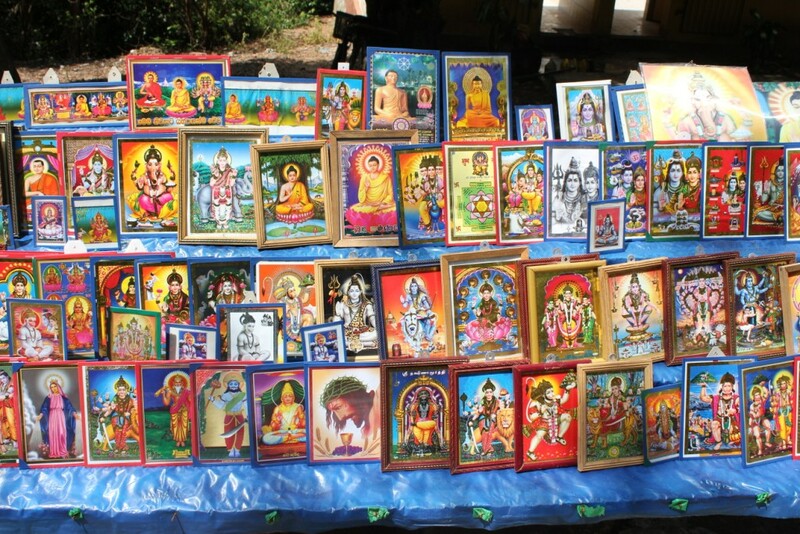 The photo was taken by a woman who works with families in Sri Lanka, helping them to be self-sufficient, and it shows a roadside stall outside a Hindu temple. Despite their difficult lives, the people this woman works with are very friendly and easygoing – and they are happy to pray to whichever god suits them at the time – no fighting over which god is the best one. Deb likes that simple, peaceful philosophy; and the image is so vibrant and colourful, she can’t help but feel inspired when she looks at it. I share the ‘people fascination’ with Deb. When my son was young and bored in the school holidays, I suggested a very exciting [for me] trip to the airport to watch the people. In the digital age, with computer games and video, he thought this was hilarious and still regales his friends, amid hoots of laughter, with the recollection of my suggestion. I still love airports and have been known to linger after farewelling guests in order to see who the teenage girl with the single red rose is waiting to greet. I love your ‘Aussie Author’ series Lisa. Hope to read many more this year.